The Swedish-Japanese joint-venture Sony Ericsson stood for premium design, camera innovation and some innovative form factor ideas, and now as the first devices coming under only the Sony brand (sans the Ericsson), it’s a good time to take a nostalgic look at the past and remember some of our favorite SE handsets of all time. We've divided this look in two parts, and this is the first one covering phones released from the beginning of the SE partnership and all the way until 2007. The second part will look at phones released after 2007, a breakthrough moment for the industry marked by the launch of the iPhone and all other phone makers starting to adjust to it or forced to adjust. The first period is when the Sony Ericsson brand was born and quickly grew popular, a true Golden Age for SE. Here's how it all began. Thumbnail image courtesy of SE-nse. The technological cell phone marriage of Sweden and Japan started with a bang in the dark days of 2001 when the company released its first breakthrough product, the Sony Ericsson T68i. This wasn’t exactly a new device as it was based on the earlier released Ericsson T68, but for the market and most of us, users, it was shocking. Why? Right in time for the 2001 Holiday season, it was the first mass phone with a color screen! There were already some limited edition phones in Japan with a color display and the huge Nokia 9210 Communicator was out there, but this was the first handset bringing color to the masses. If the masses could afford the retail price of around $650 at launch because that's what you had to pay for the T68i at the time. It stood out with its brilliant design for the time with curvy edges, a joystick instead of a navigational key and relatively compact dimensions. The display supported 256 colors and while you might laugh now, back then this was a feast for your eyes. The screen resolution was 101x80 pixels and even MMS messages (at the time, not supported by many carriers). It was packed with features as well - Bluetooth, GPRS, tri-band support, SMS and customizable ring tones. Yes, it was a dream come true in a world of monochrome displays, and it gave a glowing start to the Sony Ericsson brand! Apart from the revolutionary T68i, Sony Ericsson focused on other lower-end models, but all of them stood out with their distinct designs and often bold novelty. The low-end Sony Ericsson T100, for instance, caught the eye with its weird blue screen. And this focus on design paid off. Two years later, in 2003, the Eurasian partnership introduced the Sony Ericsson T610 which was in a league of its own with jaw-dropping looks: an evergreen combination of silver and black that spoke “premium” better than words, a 65,000-color screen and a display with a resolution of 128x160 pixels, boggled our minds. In times when cameras on smartphones were a rarity only seen on several Nokia handsets, the SE T610 boasted a mighty snapper. How powerful? It captured images with a resolution of 288x352 pixels that you could store on the huge 2MB of built-in memory. Megabytes, not gigabytes, mind you. The handset reached record sales, first arriving in the pockets of the wealthier who like its serious business looks and then to common folks. But it was just scratching the surface of the future. The T610 was followed by the not so successful T630 where SE overplayed the futuristic looks, but Sony Ericsson quickly turned the page. 2005 was a strong year for the company and it decided to follow up with the music-centric Sony Ericsson W800i which came bundled with the huge for the time 512MB card and with premium in-ear buds. The “Walkman” branding stood on the side so you couldn’t miss it. Actually, it was key for differentiating the handset which otherwise was based on the K750i. You also couldn’t miss the phone because it was colored in glowing orange. It didn’t go without its share of issues, though - SE again went for a proprietary port and did not include a standard 3.5mm jack, but this would have more serious repercussions as the W line was for music phones where audio mattered. The times of the K750i could easily be called the golden age of Sony Ericsson. The company’s next iteration in its K “Kamera phone” series, the Sony Ericsson K790i, was at the end of that golden age, and it seems that was the last handset the company could truly call successful. The K790 marked the arrival of the Cyber-shot brand on phones, letting you know SE took digicam features to the next level. The design evolved to a more modern, sleek looks. The auto-focus camera also got a boost to 3.2-megapixels, further bridging the gap with digital cameras. The screen seemed amazing at the time - a 2-inch TFT display with QVGA resolution. The fall of Sony Ericsson seems to start right after the K790i, with its successor the stylish K810i. It was a complete redesign of the looks, with rounded metallic buttons that made it look like an alien in SE’s lineup and among other phones. It was futuristic - some liked it, some didn’t, but what broke the fairy tale was not the looks, but the 3.2-megapixel camera. While fans were waiting for a 5-megapixel camera to answer rivals like the extremely popular Nokia N95, Sony Ericsson disappointingly included the very same 3.2-megapixel camera, disguised in different clothes. I still have P910i with me. SE was very innovative from the start. 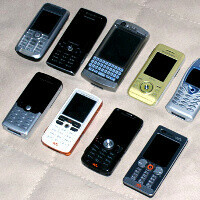 I had the K850i. I used to love that phone. My first SE phone was the 1st ever 3G phone. It was really thick and you have to twist not flip the keypad. It's camera was good at that time. I forgot what model it was. W something. Too bad it's not on the list. great phones.innovartive.but now,sony is not innovating.they are not giving us quad core and 4.7 inch screens. why,sony! Whats innovating about something everybody is doing? I find their designs to be very different in a good way. Together with Nokia they are the only 2 companies who actually try to differentiate. Sorry, but fitting 4.7" screen and quadcore in a handset is not an innovation. My first colored phone as well. I still have the T68i phone. If they ever start a mobile phone museum it will be housed there. Funny how far we've come....so fast. Keep it up PA.
wow really siemens? amazing.. imagine 10 yrs ago? the camera are 2-3 megapixels all are with alphaneumeric keys and the video capability are horrible..!! and honestly SE are one of the 1st who gave us an impressive imaging capability to a phone k800i I just miss you haha good old days were people still practicing a low sense of fulfillment.. phones dont have browsers or 1ghz processors simply talk and text :) nostalgic..
P990i tank of a phone. I still have my W580i. The best SE product ever IMO was C 702. Had they released it with 5mp camera, xenon flash, and Wi-Fi (instead of K850 model ), it would be a legend. Besides thatI had T 630, K750, C 502, Vivaz, and now arc. They're all still in use, never had any problem apart from joystick repair on K750.